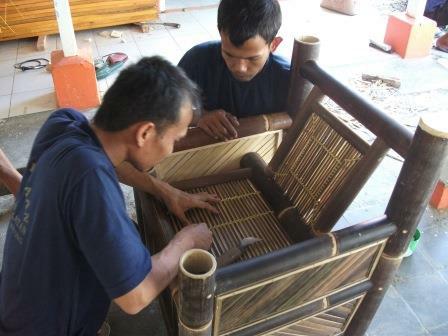 Making furniture from bamboo plants. Handicrafts of making bamboo plant into a exclusive and quality product, needs a good process. The production process will affect the product which produced, both in terms of shapes, sizes and motifs that must be met, when the consumer asks unusual products. In bamboo craft producing, the tools used is very simple, because in making this craft, what needed is the skill of the maker. 10. Brush used when finshing bamboo furniture to give a varnish coating or melamine on every surface of the furniture. Raw Material Preparation. For raw material actually all kinds of bamboo plants can to make a craft product, but the image production using bamboo plants (Gigantochloa verticillata). Cultivated bamboo age is 13 months, the consideration that the bamboo plant has a production life and has enough girth to be processed into handicraft products. Then, after the above are met, which still contained water of the bamboo must be maintained. To reduce the water content needs to be dried first, can use the oven or the manual method that is dried using sunlight so that product quality is becoming harder and able to survive more than 10 years. Preservation method is still naturally, and to produce a very good quality especially bamboo handicraft products required considerable time approximately 3-6 months is to be soaked in water to make its own pool. After undergoing a process of soaking, lift and place bamboo in order to remains of water immersion is complete, and definitely place to be sheltered from the sun and rain and the room is not too tight so that air can enter the circulation. For the production of a set rate, needs approximately 6 bamboo sticks and 12 sticks Angular models to model Sofa. Bamboo handicraft production processes which first create a frame (seat / table), the process is the earliest in determining the precise calculation of the size and make a hole that fits and whether or not to unify the order. Bamboo rod is measured for each section and cut using a saw wood. Bamboo rod with largest diameter (in this case the bottom bamboo) used for the legs of the chair for this section. As for the smaller bamboo rod will be used to frame up, down, front and back of a chair or table legs apart. Assemble bamboo begins by entering into the foot bamboo chair that had been hollowed out. Aperture should be adjusted to the size of the bamboo rod to be inserted so that the seat frame does not incorporate bamboo swaying in the hole that has been created must be careful not to break and frame bamboo furniture can stand firmly. Check the corners of the frame if it is symmetrical or not. After the order so then tied with rattan. Then split bamboo size of approximately 2 cm are used for pedestal chairs and tables as well as backrest. Typically for the rest, there is a special bamboo that has pictorial decoration to add accessories to avoid monotony. For the finishing process is done by sanding bamboo, the sanding try not too pressed, after then varnished or using melamine. drying lacquer or melamine not directly exposed to sunlight sufficient aerated to dry.